It’s one of the questions we get most often. The answer’s simple: you do not have to be an athlete in any way, shape or form. You go at your pace—always. Don’t get us wrong—we like pressure. It keeps our wine corked, our bike tires firm, and our olive oil delicious. But when it comes to the journey, pressure is strictly verboten. We believe that you should go at whatever speed suits you: slow, fast, or sipping Chianti in the van. That’s why we have something for everyone, and in Europe we have electric-assist bikes that are great for cyclists who need a boost up any hills. We cater to everyone from the fitness freak to the couch potato (you do have to get off the couch, though). Due to pesky things like topography, we classify our active trips according to how far you might want to go each day and how challenging the terrain is. This helps people choose the trip that’s right for them. That said, whatever trip you choose, you can ALWAYS move at your own pace. What if you run out of gas part way through the day? The B&R van will whisk you to the hotel at a moment’s notice. What if you want to log another 30-km ride after lunch? Our guides always have suggested extensions in their back pockets. The Terrain: 6-10 km (4-6 mi.) a day on country lanes, footpaths and coastal or forest trails, all on relatively flat terrain, perhaps with an occasional hill. The Terrain: 40-50 km (25-30 mi.) 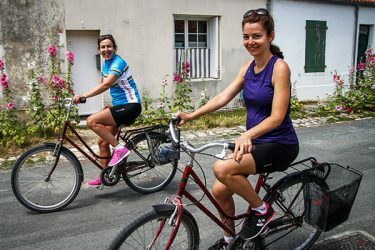 a day over relatively flat terrain with a few small hills—all very manageable for people trying their first biking trip. The Terrain: 8-12 km a day over relatively flat terrain, with occasional steeper climbs. The Terrain: 40-50 km (25-30 mi.) a day over terrain that’s relatively flat but will include inclines and the occasional climb or two. The Terrain: 11-15 km (7-10 mi.) a day over rolling terrain on a variety of surfaces. Most days, one or two steeper climbs to spectacular viewpoints or places of interest. The Terrain: 40-50 km (25-30 mi.) a day in gently rolling countryside, with occasional longer climbs to points that are well worth the effort. Layover days accommodate varying preferences. The Terrain: 11-15 km over terrain that varies between rolling and hilly, with a few steeper climbs. The Terrain: Roughly 50 km (30 mi.) a day in consistently rolling countryside, with repeated climbs and longer options available. The Terrain: 11-15 km (7-10 mi.) a day over fairly hilly terrain offering lots of challenges. Routes are along high meadow paths and/or well-maintained cliffside or alpine trails, with a few steep ascents to make you feel invigorated. The Terrain: 50-60 km (30-45 mi.) a day over both level and tougher, hillier terrain with multiple 100 km (62 mi.) options. The routes are designed for avid cyclists and include plenty of chances to push yourself.